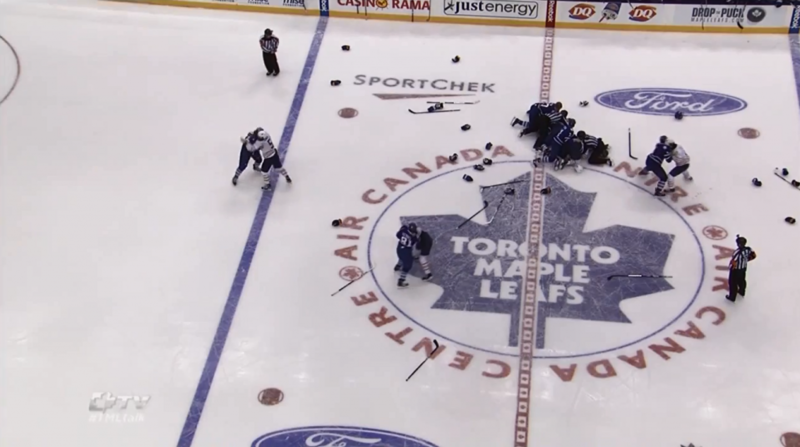 If you missed it last night, there was an epic brawl in the (preseason!) Leafs / Sabres game. It started when Sabres tough guy John Scott (6’8″, 270lbs) jumped Leafs scorer Phil Kessel (6’0″, 202lbs). The Leafs responded, including a goalie fight between Bernier and Miller. All in all, the Leafs fared better in the brawl. They also won the game 5-3. The fights might cost the buds though, with David Clarkson expected to be suspended 10 games for leaving the bench during the fights. Phil Kessel might also get suspended a couple games for his stick-work. In the regular season, the Toronto Maple Leafs and Buffalo Sabres play a back-to-back on November 15-16. I won $2250 in the Shoot for Loot at a Toronto Maple Leafs game a few years ago. $2250 is a lot of money for me. What does it mean to the NHL? Another NHL season is upon us, and for the second time in seven years we likely won’t get to see any of it. 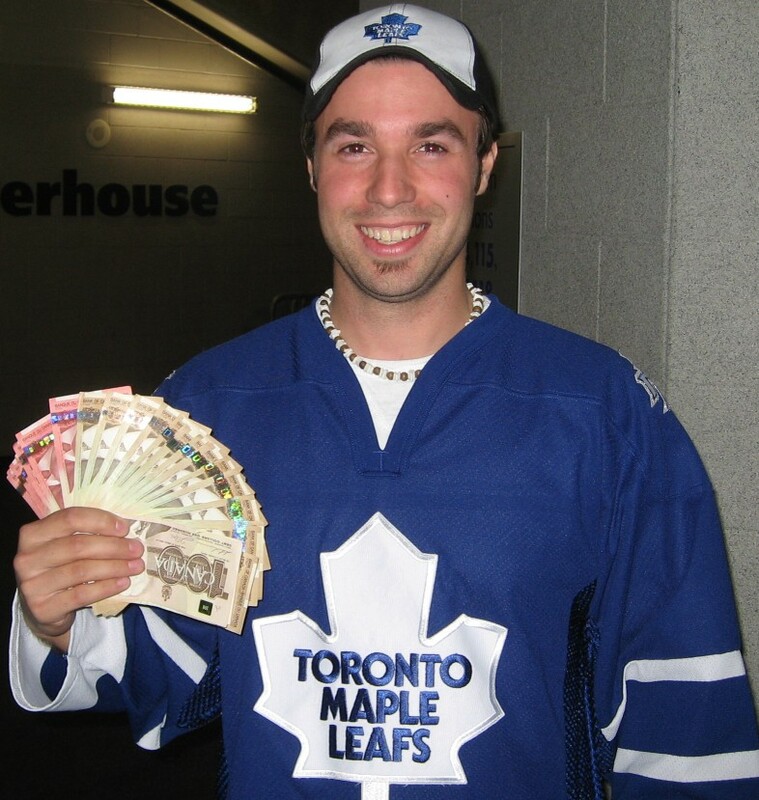 After the last lockout in 2004-05 fans forgave the players and the owners, and quickly came marching back with their wallets open for the start of the 2005-06 season. The global economic prospects are grim. People are out of work. The economy is slow. Ordinary folks are having a hard time. And the people whose livelihood depends on the NHL are just plain out of luck. And yet we get to listen to millionaires squabble over how to divide their 100’s of thousands or millions of dollars amongst themselves? Give me a break. A couple friends of mine have recently commented on the subject, and so I share their remarks with you here. They are bang on (except for Adam – football isn’t better than hockey). Your lack of season this year will not affect me. There are a variety of reasons for this, and I have outlined them below. Suffice to say, I don’t care which set of rich men takes slight advantage of which other set of rich men. Why I will not miss the NHL this year, a list. A) For pro sports, I watch football. Lets get this out of the way to begin with. I won’t miss you because I only pay attention to you tangentially. There are a ton of reasons why I’m not in to hockey, mostly based around the Canadian Cult of Hockey, but simply put, you don’t do it for me. I mean, I like hockey, I like to watch hockey, but that just brings us to…. E) Owners: you run a multi-billion dollar game, so you are the only people in the world who CANNOT complain about how ridiculous pro hockey salaries are. It’s your own fault. You run a price-gouging enterprise that rivals mob-run casinos for it’s moral intentions. You exist in a world where, rather than supporting and facilitating competition between high level athletes, AND being permitted to make a living from it, you are obsessed with profits. Do you give a crap about the people who want to watch the game for the sake of the game? No, you don’t. If you care about the game, you don’t sell $10 watered-down beer, or $8 hotdogs. I, personally, am not much for football, but otherwise I think my friend Adam here is dead-on. The one thing I’d add that he does not address is the number of “average” folk (people who work in sports bars, restaurants, and the arenas themselves) who are either going to be laid off or given reduced hours until the lockout ends. In fact, in Winnipeg (where the fledgling Jets are only a year old), they can’t even balance out the lack of hockey by booking more concerts because they can’t book anything on scheduled game nights, JUST IN CASE the lockout is resolved. So while the lack of season does not affect me any more than it affects Adam, it does affect MANY people via a) the millions of dollars in lost revenue to local businesses on game nights and b) the lost wages (and potential layoffs) for those who depend on the arenas and associated businesses for employment. This is more than just a flagrant disregard for your fan base, this is a blatant disregard for the very lives of the people who actually depend on the industry you’ve created around your sport. Teachers & doctors are getting their wages frozen or reduced, while NHLers squabble about how to divide their millions? Wow. The last two sentences sum up this issue perfectly – and fans will not be quick to forgive the NHL owners and players this time (who are both, by the way, equally to blame for this mess). Stop behaving like spoiled brats and get back to work: people’s lives (literally) depend on it. Almost immediately after I posted this blog, it flashed across my Twitter feed that the Ottawa Senators have already started laying off staff and reducing the work-week for others. You can read the story by clicking here. These are ordinary people – not spoiled NHL players or owners. Not to be overly dramatic about it, but this is reality: these people are now looking for other jobs. They might be wondering how to put food on their kids table this winter. I wonder if Jason Spezza and Eugene Melnyk are having similar thoughts on account of the lockout. Cabbie has a bunch of great clips, check out his YouTube Channel for more! and I even defended it when some people (though really not many) still thought the Devils could come back after being down 0-3 in the final to the Kings. I was tied for second place going into Game 6 in the finals, but the team I was tied with had Dustin Brown, who had one hell of a game compared to my Williams and Elias. I ended up with 73 points to their 76. The first place ran away with it with 98 points – powered by three well-chosen Devils: Ilya Kovalchuk (19 points), Zach Parise (15 points), and Travis Zajac (14 points).